Dr. Bergren decided on a career in veterinary medicine when she was 7 years old. After growing up in the suburbs of Chicago, she attended Bucknell University where she received her Bachelor's of Science degree in Biology in 1987. 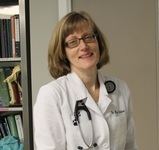 She then returned to Illinois to earn her DVM from the University of Illinois, College of Veterinary Medicine in 1991. Since earning her DVM, Dr. Bergren has practiced as a small animal veterinarian in Illinois, Pennsylvania and Connecticut. Dr. Bergren lives with her husband, two daughters and goofy standard poodle Harvey. When at home, Dr. Bergren enjoys digging in the garden, cooking, baking and spending time with her family. Dr. Gamble hails from Virginia and received a Bachelor's of Science and Master's in Biology from the College of William and Mary in Williamsburg, Virginia in 1998 and 2000 respectively. Dr. Gamble's Master's work focused exclusively on animal behavior, for which she has a strong affinity. She graduated from Tufts University, College of Veterinary Medicine in 2004 and has worked in southeastern Connecticut every since. She joined Four Paws Veterinary Services, PC in the summer of 2008. In addition to practicing veterinary medicine, she enjoys spending time with friends and family, cooking, reading, playing the piano and doing anything outdoors with her rescue dog Josie! Dr. Mary Juber grew up in Minnesota knowing she wanted to become a small animal veterinarian. She received a Bachelor's of Arts in Biology from St. Catherine University in St. Paul in 1982, and a Bachelor of Science in Veterinary Science in 1984. She graduated from the University of Minnesota College of Veterinary Medicine in 1986, and she completed an internship in small animal medicine, surgery, and emergency practice at the New Haven Central Hospital for Veterinary Medicine in 1987. She has had the privilege of working in many settings, including full-time and relief (per diem) small animal practice, mobile feline spay/neuter, emergency practice, and shelter medicine. She has performed relief work for Four Paws Veterinary Services since 2009, joining the practice part-time in 2014. Her veterinary interests include surgery, pain management and behavior. Dr. Juber and her husband are proud parents of two adult daughters. They care for two cats, Silas and Sailor and countless pond goldfish. 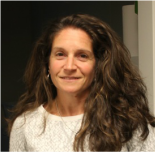 Dr. Cheryl Monteiro earned a Bachelor's of Science in Biology from Tufts University in 1989 and a Master's degree in Animal Science form the University of Rhode Island in 1992 where her research focused on pain management. She graduated from the University of Minnesota College of Veterinary Medicine in 1996. While attending veterinary school she received the Caleb Dorr Award for scholastic achievement and a Memorial Scholarship for collegiate citizenship and academic excellence. She worked in a small animal private practice in New York before moving to Connecticut. Dr. Lawrence Monteiro earned a Bachelor's of Science in Biology from Tufts University. He attended the University of Rhode Island's graduate program in Animal Science. He graduated from the University of Minnesota College of Veterinary Medicine in 1996. He started his practicing career as a dairy veterinarian followed by working at a mixed (large and small) animal clinic in upstate New York. Since moving to southeastern Connecticut, Dr. Lawrence Monteiro has practiced exclusively companion animal medicine and surgery. Dr. Lawrence Monteiro worked in several small animal clinics in New London County before starting his own practice with his wife Cheryl. Doctors Lawrence and Cheryl Monteiro live with their two children, cat and chinchilla. Lisa started her career in veterinary medicine in 1989 as an employee of Old Mystic Animal Clinic. In 2006, Four Paws Veterinary Services, PC purchased Old Mystic Animal Clinic and Lisa continued with the practice as it made its transition to new ownership. She is a familiar face to the original client base of Old Mystic Animal Clinic and welcomes new clients to the practice as one of the clinics receptionists. Lisa also frequently assists the veterinarians on house calls as well as keeping the clinic stocked with all of the needed supplies. Lisa lives with her husband, cat and one very energetic dog. All of Lisa's pets were acquired "in the line of duty". Rhonda joined Four Paws Veterinary Services, PC during the fall of 2016. She has been working in animal clinics for over 20 years. She has been employed as a technician, office manager and receptionist at several different clinics and is happy to have settled in at Four Paws Veterinary Services. She is assisted at the front desk by her recently adopted elderly miniature poodle LWD (not pictured). Fayola (pictured) is one of several animals with whom Rhonda shares her home. Sandor recently graduated from college earning his Bachelor's of Science in Biology. He plans to apply to veterinary college in the future and has recently joined Four Paws Veterinary Services, PC in an effort to gain experience in working in a small animal clinic. Sandor has extensive experience in caring for wildlife and is a licensed wildlife rehabilitator. Following graduation from veterinary college, he hopes to one day open his own animal clinic to serve either native wild animals or avian species. "Kasha" joined Four Paws Veterinary Services, PC in July of 2006 shortly after the practice purchased Old Mystic Animal Clinic. Kasha has a way of making clients very comfortable as they often ask for her by name. A skilled veterinary assistant, she divides her time between assisting the doctors with patient exams and treatments, laboratory procedures and reception. Kasha also keeps a steady watch on any patients hospitalized over the weekend as well as the few resident cats that call the clinic home. She lives with her husband and their three daughters, two dogs, two horses and numerous chickens. Abby began interning at Four Paws Veterinary Services, PC during her senior year at Waterford High School. With an interest in exploring a career as a veterinary technician (nurse), Abby worked as an intern, earning high school credit while also gaining exposure to the multiple employment opportunities within a small animal clinic. Abby was hired as a receptionist following graduation from high school and continues to work at FPVS while also attending college. She is presently enrolled in the Veterinary Technology Degree Program at Middlesex Community College. While not attending classes or working at FPVS, Abby enjoys visits to the beach, snowboarding and spending time with her cat Beans and her dog Ruby. Animals have always been a huge part of Erin's life. She grown up with dogs, horses, rabbits and many other kinds of critters. Erin got her first rabbit when she was seven years old and started riding horses at that same age. When not at work, Erin spends her time riding her Quarter horse Missy and caring for the rest of her animal family. Erin is enrolled at the University of Rhode Island, where she is currently working on her bachelors in animal management. Erin's two pitbulls Tommy and China are always by her side along with her feisty cat Virgil. With the three of them, there is never a dull moment. Most of Erin's animals are rescues that have finally found a safe and permanent home with me. A valued member of our hospital team since September of 2006, Sue wears many hats. Having worked in small animal veterinary practice for many years, her experience also comes from a lifetime of owning and living with animals. Sue assists the veterinarians with surgery and patient exams as well as occasionally assisting clients in reception with a smile on her face! In her spare time, she enjoys spending time with her family, two Havanese dogs, two cats and an African Gray parrot. After working with "youth at risk" for more than ten years, Gail transitioned into the animal science world, graduating from New Hampshire Community Technical College's Veterinary Technician Program in 2004. Gail joined our Four Paws Veterinary Services, PC team in October of 2017. She splits her time at Four Paws working at both the reception desk as well as in the exam rooms and treatment area. Her favorite aspect of her job is the diversity that each day brings. During her free time she enjoys kayaking, hiking, camping, spending time with family and tackling DIY home improvement projects. Gail shares her life with her husband Tim, English Bulldog Sheamus and Siamese cat Danielson. While living in New Hampshire, Gail accompanied Sheamus to senior living facilities where he provided residents with companionship as a therapy dog and hopes to continue to do so here in Connecticut. Mindy started at Four Paws Veterinary Services, PC during the summer of 2013 as a veterinary technology student fulfilling an externship requirement. Having demonstrated the ability to apply what she was learning in tech school, a keen attention to detail and a strong work ethic, Mindy was offered a position at Four Paws Veterinary Services, PC even before she had graduated. Mindy earned her Associate's of Science in Veterinary Technology from Becker College in 2013. Mindy assists the veterinarians with patient exams, treatment procedures and surgery. She has an interest and aptitude for performing the many laboratory tests that are run in-house at Four Paws Veterinary Services, PC and is frequently found in our laboratory in front of the microscope. During her time away from the clinic, Mindy enjoys playing lacrosse, attending outdoor country music concerts and spending time with her boyfriend and three dogs Leya, Bella and Buck. Emily has been with Four Paws Veterinary Services, PC since September 2016 and enjoys helping our clients at the desk and assisting with appointments and hospitalized patients. She is a senior marine biology and animal science major at the University of Rhode Island and spends her weekends and school breaks working at the clinic. Emily aspires to combine her passion for marine biology and veterinary medicine by pursuing a career as a zoological veterinarian. She is in the midst’s of applying to vet school and loves having the opportunity to get to know the patients and clients as well as learn important veterinary skills at FPVS. Emily is an active member of the Mystic Aquarium's Animal Rescue Program, where she routinely assists with veterinary care and animal rescue operations. Emily's favorite role at the aquarium is providing neonatal care to harbor seal pups because they are a lot like the puppies we see here at the clinic! Sam is a part time member of our team who has been with Four Paws Veterinary Services, PC since 2009. She divides her time between reception, assisting doctors with appointments and caring for hospitalized patients. Sam has a very gentle manner and always wears a smile. She is eager to help clients and doctors in caring for the animals that visit the clinic. When not at work or caring for her two young children, Sam competes in driving competitions with her draft horses. Originally from the Boston area, Lisa earned her Bachelor's of Science Degree in Accounting from Bridgewater State College. She moved to Southeast Connecticut in 2003 with her young family, a cat and a dog. Lisa began work at Four Paws Veterinary Services, PC in 2006 as the bookkeeper, a position that continues to develop simultaneously with the growth of the practice. Bookkeeper only begins to describe Lisa's role at FPVS as she not only keeps track of the financial records but also plays a central role as a human resource manager juggling the many aspects of that that position. Growing up with a love for animals turned into a passion as an adult. During her high school years, Lauren's first job was working at a local kennel. It was here that she became interested in veterinary medicine. Following high school, she took on-line courses through Penn Foster Career School and earned her Veterinary Assisting Certificate. Lauren started working as a veterinary assistant in 2012. 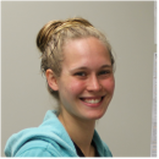 Lauren joined Four Paws Veterinary Services, PC in 2015. With a positive attitude and ability to multitask, Lauren contributes to the clinic as both a receptionist as well as assisting the veterinarians in the exam room, treatment area and surgery suite. When not working, Lauren enjoys honing her equestrian skills with her horse Morrie, skiing and working on creative art projects. Lauren and her boyfriend dream of someday sharing their home with a puppy! Laura started her veterinary technician career in 2000. She joined Four Paws Veterinary Services, PC very shortly after Dr. Gamble in 2008 as the practice began to require additional technician staff. Having previously worked with Dr. Lawrence Monteiro prior to the acquisition of his own business, Laura was a perfect addition to the clinic team. Laura assists with surgery and examinations, as well as keeping the clinic well stocked with prescription food. Laura's love and compassion for animals is exemplified by her very gentle and sympathetic approach to handling both ill patients and their owners. She lives with her husband, dog and Red Eared Slider. Beth's experience with animals comes from a lifetime of having horses, cats, turtles and birds. She received a bachelor of Arts in Sociology from Roanoke College in 2000. After having been laid off from the corporate world, Beth transitioned into a career as a veterinary assistant in 2003. She later went on to complete an Associates of Science in Veterinary Technology from Becker College in 2008 and passed the Veterinary Technician National Examination to become a Certified Veterinary Technician in 2009. She then received a Bachelor's of Science in Veterinary Science/Pre-Vet also from Becker College in 2010. In her spare time she enjoys spending time with her husband, her daughter, two dogs and two cats. 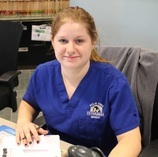 Chelsea began working at Four Paws Veterinary Services, PC. during her senior year of high school. She has continued her education and is presently pursuing a Bachelor's of Animal Science at the University of Connecticut. Chelsea works at Four Paws as a receptionist and technician assistant always eager to help clients and patients that visit the clinic. She hopes to one day own and operate a mobile grooming service which would allow her the ability realize her passion of working with animals. When not attending college or working, Chelsea enjoys spending time on her family's farm with her mule Remington, mini donkey Waylon, bunnies Thumper and Little B, cats Pippy, Junior and Earl and dog Callie. Justine's best friends have always been animals of all shapes and sizes. With a strong background in business and customer care, Justine enjoys keeping clients happy. When not at the reception desk at Four Paws Veterinary Services, PC, Justine works as an accredited horseback riding and driving instructor and trainer. At home, Justine enjoys the company of her two lorikeets Birdo and Rainbow, and her keeshond Otter.